The simulation solves a decades-old mystery surrounding the tiny galaxies that swarm around the outside of our much larger Milky Way. Previous simulations predicted that thousands of these satellite, or dwarf, galaxies should exist. However, only about 30 of the small galaxies have ever been observed. Astronomers have been tinkering with the simulations, trying to understand this "missing satellites" problem to no avail. Now, with the new simulation—which used a network of thousands of computers running in parallel for 700,000 central processing unit (CPU) hours—Caltech astronomers have created a galaxy that looks like the one we live in today, with the correct, smaller number of dwarf galaxies. "That was the aha moment, when I saw that the simulation can finally produce a population of dwarf galaxies like the ones we observe around the Milky Way," says Andrew Wetzel, postdoctoral fellow at Caltech and Carnegie Observatories in Pasadena, and lead author of a paper about the new research, published August 20 in Astrophysical Journal Letters. One of the main updates to the new simulation relates to how supernovae, explosions of massive stars, affect their surrounding environments. In particular, the simulation incorporated detailed formulas that describe the dramatic effects that winds from these explosions can have on star-forming material and dwarf galaxies. These winds, which reach speeds up to thousands of kilometers per second, "can blow gas and stars out of a small galaxy," says Wetzel. Indeed, the new simulation showed the winds can blow apart young dwarf galaxies, preventing them from reaching maturity. Previous simulations that were producing thousands of dwarf galaxies weren't taking the full effects of supernovae into account. "We had thought before that perhaps our understanding of dark matter was incorrect in these simulations, but these new results show we don't have to tinker with dark matter," says Wetzel. 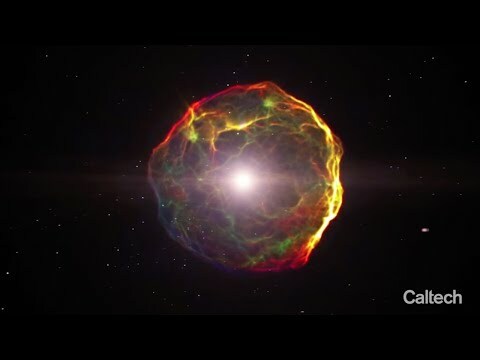 "When we more precisely model supernovae, we get the right answer." Astronomers simulate our galaxy to understand how the Milky Way, and our solar system within it, came to be. To do this, the researchers tell a computer what our universe was like in the early cosmos. They write complex codes for the basic laws of physics and describe the ingredients of the universe, including everyday matter like hydrogen gas as well as dark matter, which, while invisible, exerts gravitational tugs on other matter. The computers then go to work, playing out all the possible interactions between particles, gas, and stars over billions of years. "In a galaxy, you have 100 billion stars, all pulling on each other, not to mention other components we don't see like dark matter," says Caltech's Phil Hopkins, associate professor of theoretical astrophysics and principal scientist for the new research. "To simulate this, we give a supercomputer equations describing those interactions and then let it crank through those equations repeatedly and see what comes out at the end." The researchers are not done simulating our Milky Way. They plan to use even more computing time, up to 20 million CPU hours, in their next rounds. This should lead to predictions about the very faintest and smallest of dwarf galaxies yet to be discovered. Not a lot of these faint galaxies are expected to exist, but the more advanced simulations should be able to predict how many are left to find. The study, titled "Reconciling Dwarf Galaxies with ΛCDM Cosmology: Simulating A Realistic Population of Satellites Around a Milky Way-Mass Galaxy," was funded by Caltech, a Sloan Research Fellowship, the National Science Foundation, NASA, an Einstein Postdoctoral Fellowship, the Space Telescope Science Institute, UC San Diego, and the Simons Foundation. Other coauthors on the study are: Ji-Hoon Kim of Stanford University, Claude-André Faucher-Giguére of Northwestern University, Dušan Kereš of UC San Diego, and Eliot Quataert of UC Berkeley. Simulated view of our Milky Way galaxy, seen from a nearly face-on angle. This image was created by simulating the formation of our galaxy using a supercomputer, which, in this case, consisted of 2,000 computers linked together.. In a new simulation of the formation of our Milky Way galaxy, astronomers were able to, for the first time, correctly predict the number of dwarf galaxies observed today. 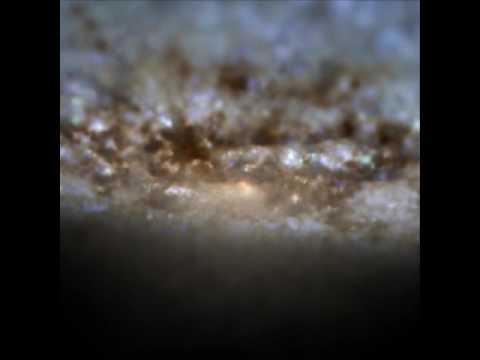 Dwarf galaxies are small galaxies that swarm around the outside of the Milky Way. Prior simulations found thousands of them—far more than the 30 or so observed so far. 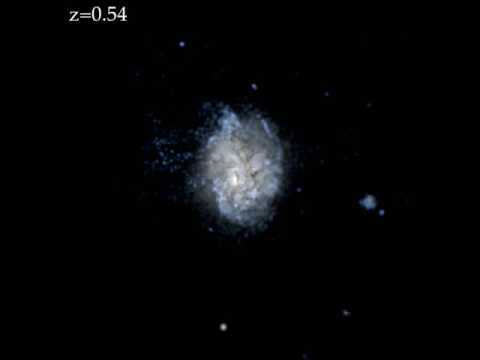 This image from the new simulation shows our galaxy with the correct number of dwarf galaxies. The streak is a tidal tail from a torn-apart dwarf galaxy.